I was in the dressing room at Kohl’s today trying on a swimsuit (Scary Movie 4) when I heard a lady cry out, “Is anyone in here who can help me? I’m stuck!I tried on a blouse and can’t get it off” I yelled back that I could help. After quickly putting on jeans over my swimsuit (because who needs trauma on top of trauma), I went to her dressing room to find her motionless with her arms pulled in front of her body literally stuck in her shirt. I pulled the shirt over the stranger’s head thus fulfilling one of the most oddest Good Samaritan jobs I’ve done in a while (or ever). The story gets even stranger. Rewind the clock a couple of hours earlier to a book release party where I enjoyed celebrating a good friend’s accomplishment and eating a few mini cupcakes (which I don’t advise before trying on swimsuits). 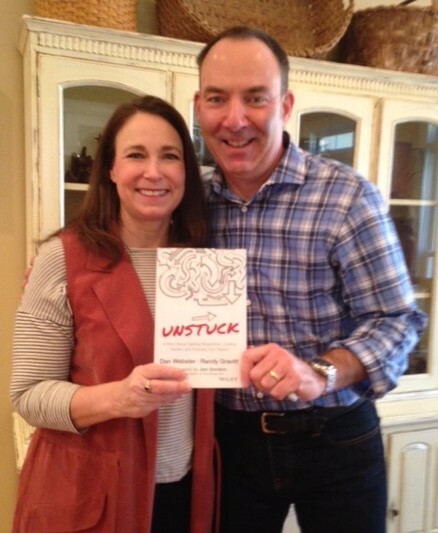 The irony – the book is titled Unstuck: A Story about Gaining Perspective, Creating Traction, and Pursuing Your Passion. What are the odds that I can celebrate a book about helping people who are metaphorically stuck in life then help someone who is literally stuck in a shirt all within an hour? Do these things happen to anyone else or just me??? I could not make this stuff up if I tried!!! Here’s why I would encourage you to read this book. First, I am good friends with the authors, Randy Gravitt and Dan Webster, and they are the real deal. They practice what they preach. They are living a life of fulfillment because they are pursuing their passions. Second, both of these men have been instrumental in helping my husband get unstuck in his life. Finally, I would encourage you to read this book for the next generation (you knew this was coming). The next generation deserves to see their parents living lives of purpose. The next generation deserves to see teachers called to a profession they love. The next generation deserves to have role models who are not simply going through the motions of life but rather living intentionally and with passion. How will they ever live to their potential if we never model this for them? This fable is about a man who has lost his vision and drive and is stuck in life until a crisis reframes his circumstances. An acquaintance shares principles to help him realign his life with his passions and gifts. (And all of this happens without him changing careers, so don’t get be nervous about that). The book also has a workbook in the back for you to apply the principles to your own life and realign your life with your passion and gifts. What better gift to give yourself than some time to reflect on your life and its direction? I am also excited that I got to be a small part of this book by reading and marking before it went to Wiley’s editors. Stepping into Room 128 each and being a part of projects like this that I believe in is fulfilling and keeps me from being stuck in life. And anytime I am mentioned in a book with John Orr, it’s a good day. Side note: remember to be kind to English teachers because you never know when you may need their red pen help, but I digress. Thank you, Randy and Dan, for this gift. May it encourage people to live the lives they are created to live.